European champions Saracens can emulate the great Crusaders side of the 2000s, says England boss Eddie Jones. The New Zealand franchise won seven Super Rugby titles between 1998 and 2008, with players such as Richie McCaw and Dan Carter also forming the spine of the All Blacks team. Jones hopes England's Saracens players can also win with club and country. "It's winning habits. Hopefully we will see the same with these Sarries players," the Australian said. 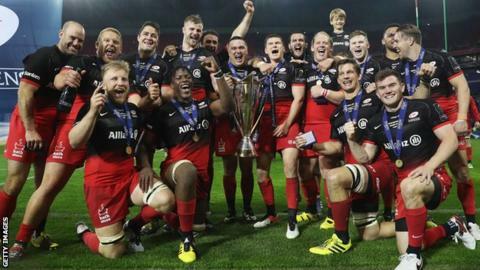 Premiership side Saracens beat Racing 92 on Saturday to become champions of Europe for the first time. Jones says he was delighted with the form of his England contingent in the 21-9 win in Lyon. "I thought they were superior in every aspect, and I was really pleased with our England squad players - Owen Farrell, Billy Vunipola, George Kruis, Maro Itoje, Mako Vunipola - I thought all stood out as top-class international players," Jones added. Second row Itoje, described as a "Vauxhall Viva" by Jones during the Six Nations, was again outstanding, claiming another man-of-the-match award. "He's done extremely well and I am so pleased with his progress," Jones said. "As long as he keeps his feet on the ground and keeps working hard he will definitely end up a Rolls-Royce. "There are little bits of his game he still needs to work on. There are areas of his ball-carrying that can improve, and his contact work can improve. "They are small things but they are significant things. When you are a world-class player you don't have any deficiencies in your game, that's why you are a world-class player, and that's what he has to keep working on." It has been a breakthrough season for Itoje, who won his first England cap in February, and has since won a Grand Slam and a Champions Cup. But Jones says it is vital the 21-year-old does not get swept up by the hype around his performances. "That's always a concern, and we've seen that with a number of young players in England particularly," he said. "We are just going to make sure he gets the right people around him, and when he's with us we manage him well, and I'm sure Saracens will manage him well."